Abstract : Realistic hair modeling is a fundamental part of creating virtual humans in computer graphics. 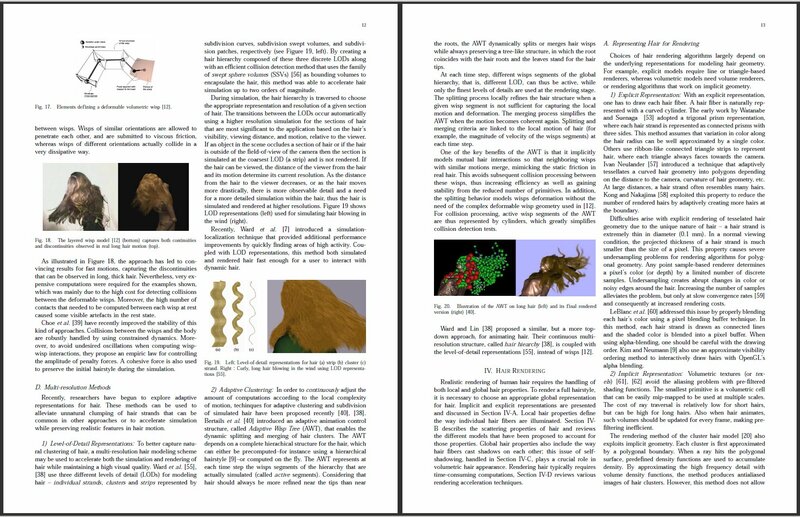 This paper surveys the state of the art in the major topics of hair modeling: hairstyling, hair simulation, and hair rendering. Because of the difficult, often unsolved, problems that arise in all these areas, a broad diversity of approaches are used, each with strengths that make it appropriate for particular applications. We discuss each of these major topics in turn, presenting the unique challenges facing each area and describing solutions that have been presented over the years to handle these complex issues. Finally, we outline some of the remaining computational challenges in hair modeling.